HealthAid Sibergin contains highly concentrated Siberian Eleuthero root extract, matured to contain optimum levels of eleutherosides, which are believed to help sustain energy levels. Eleutherosides in Siberian Eleuthero are believed to offer a steadier- and more natural- release of energy*. Siberian Eleuthero was traditionally used to prevent colds and flu and to increase energy longevity and vitality. It is widely usedas an adaptogen. An Adaptogen is a substance that helps the body cope better with either mental or physical stress. 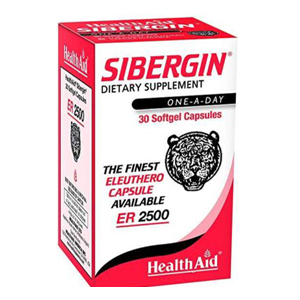 Siberian Eleuthero is also known to help improve athletic performance and increase muscle strength. Free From GMO, Yeast, Gluten, Wheat, Starch, Lactose, Dairy, Corn, Nuts, Salt, Artificial Colors, Preservatives and Flavorings. 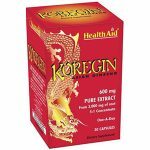 Koregin® is the most potent one-a-day capsule available. Only Koregin® contains 600 mg of the finest quality whole root concentrate (5:1) derived from 3,000 mg of Ginseng root.Koregin® provides the maximum benefit of standardized Panax Ginseng extract.Koregin®\'s unique patented paste extract and pharmaceutical quality European capsule delivery system assures maximum absorption and assimilation.